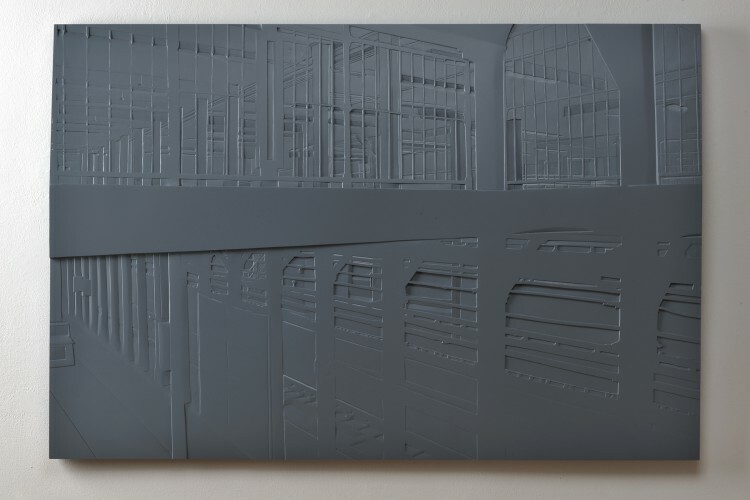 Gregory Lind Gallery is pleased to present Grey Area, Sarah Bostwick’s fourth solo show with the gallery. 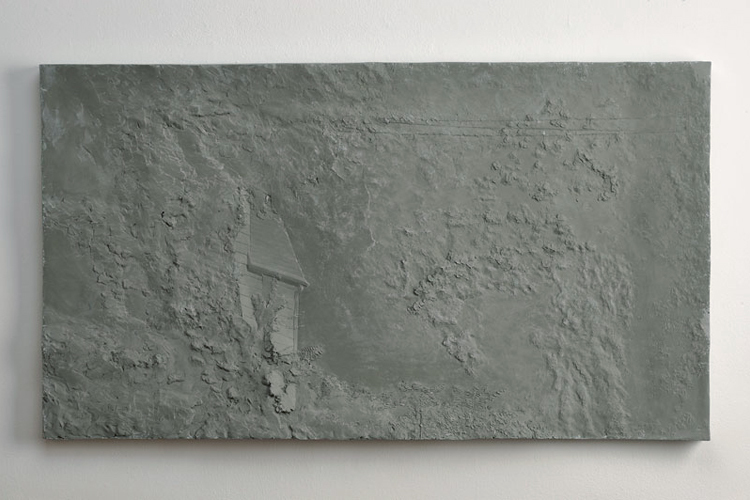 Bostwick’s latest series of cast relief landscapes capture time with cinematic clarity. Inspired by night photography, the works feature deep shadows that encompass the edges of each rendered image. 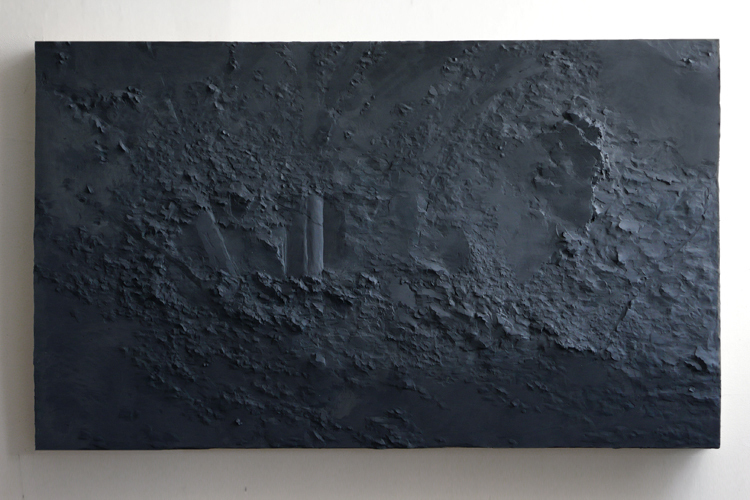 Bostwick utilizes light to define pictorial space and to transform the perceived time in which the scenes are set. 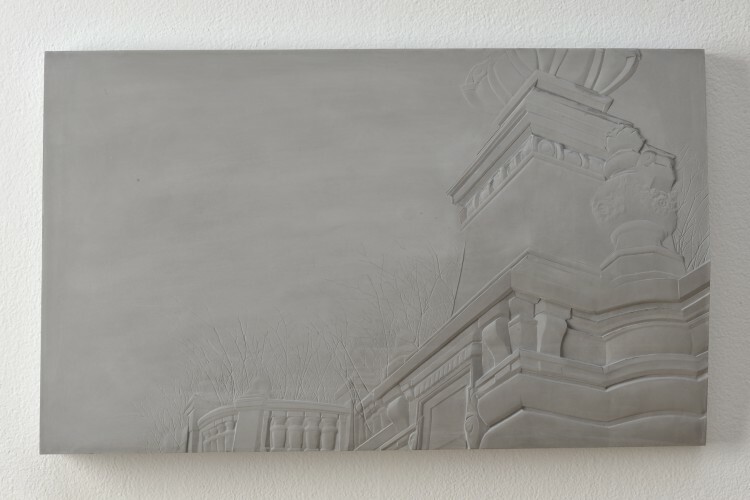 As dusk falls, twilight illuminates a ghostly light in each relief, revealing an astonishingly atmospheric depth. 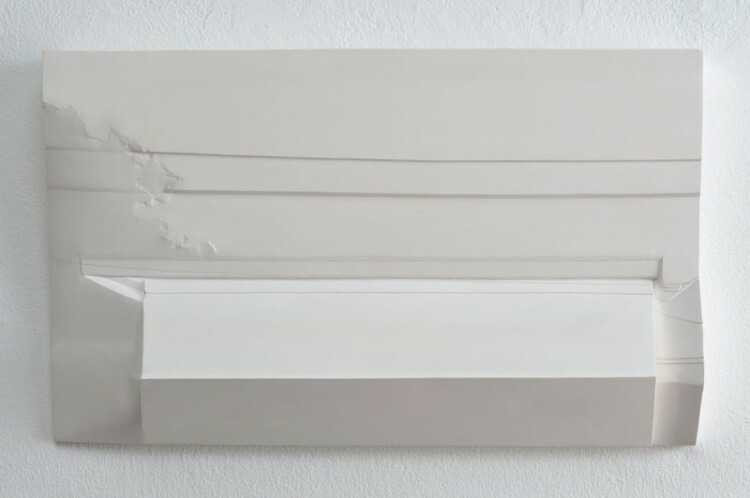 Bostwick’s works, which are cast in grey tinted Hydrocal plaster or grey painted resin, work to communicate found space through three-dimensional drawing. Once tied strictly to the built environment, Bostwick ventures into depictions of the natural world, especially lingering on the places where the two realities meet. Queens Garden (2011) meshes the low relief of tight architectural details with deep, quick marks that build out natural forms found in a wild urban garden. Tree leaves and large plants fight for room with the fences built to claim their ownership. Katonah (2011) illuminates the only visible corner of a New England home otherwise obscured by dense vegetation. 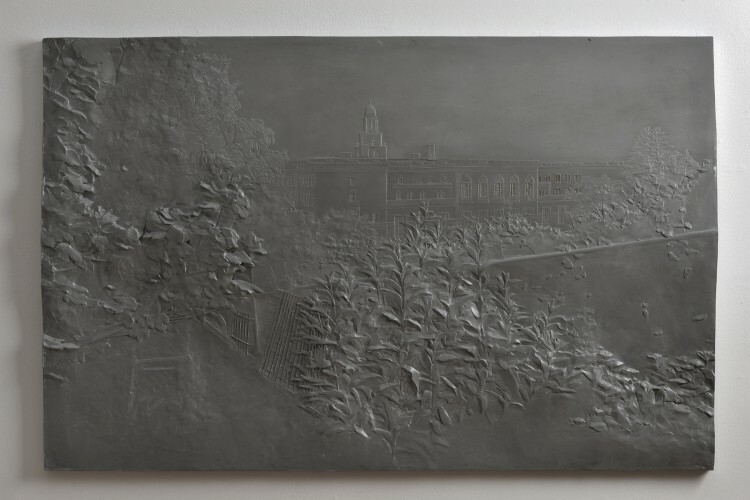 Built in clay and then cast in tinted Hydrocal polymer, this relief captures the density created by the edge of the forest and the vines that have engulfed it. Union Square 4 5 6 (2011) uses subtle, large plane shifts to delineate the upper and lower passages of a well-traveled New York City subway station. Carved vertical columns weave in and out of horizontal lines depicting lighting fixtures and signage that crisscross the ceiling in the pedestrian walkway. The lower portion of the relief tilts back toward the wall to create a dark, cavernous subway track area buried below the concourse. Bostwick’s deft interweaving of the characteristics that separate the subterranean from the daylight realm, depth from surface, nature and civilization reveal elements poised against each other in a dynamic tension of texture, shadow, and reflection. 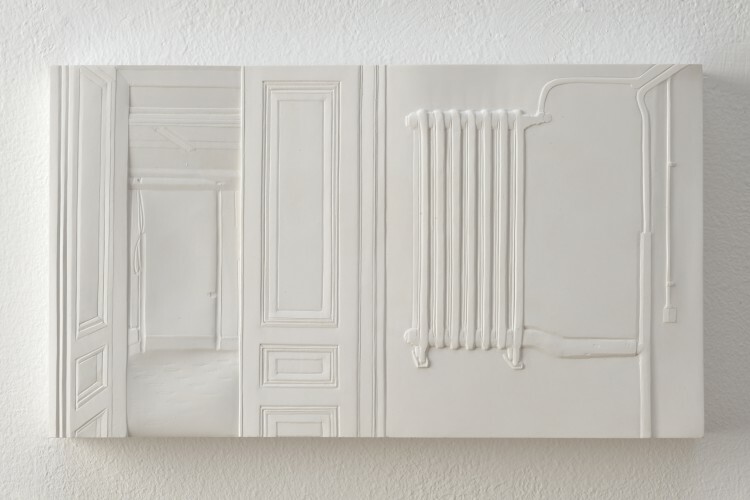 Grey Area attempts to push relief sculpture to its limits, presenting works situated on the edge of three-dimensional objects and pictorial space.